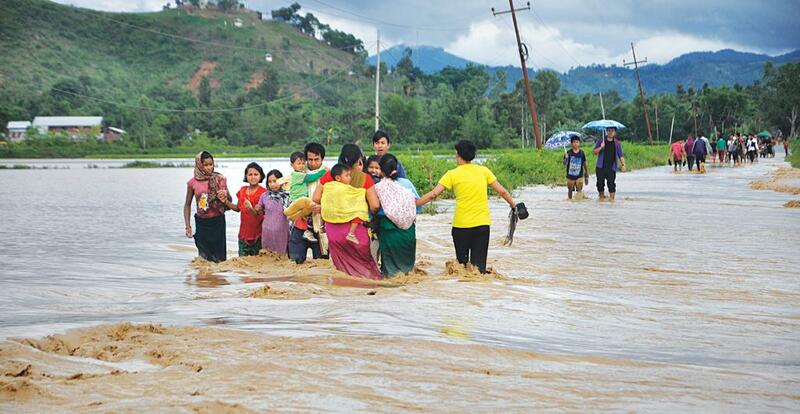 People living downstream of Mapithel dam in Thoubal district of Manipur could not contain their anxiety. They had heard of reports of leakages. On July 25, residents of six villages on the border of Bishnupur and Thoubal districts reached the office of the mega dam. “We went to get an opinion from the engineers so that we could prepare for any eventuality,” says Tentenbam, a resident of Tumunkhong village and spokesperson for the Thoubal Dam Downstream Affected People. “We were told that if we see muddy water we should evacuate immediately, but if clear water flows in the Thoubalriver, we should stay.” By the next evening, about 10,000 people from these villages started moving to higher grounds. By August 3, they had set up temporary shelters at T C Pokpi, Meitei Nongdam and other areas in the foothills. Some put up in trucks and tractors along a road. “Leakage was visible and soon we saw muddy water coming out of the dam,” says Tentenbam. Thounaojam Shyamkumar, member of Legislative Assembly (MLA) from Andro, where the dam is being built, says when he went to check the situation officials told him that the dam is leaking. State irrigation and flood control department, however, says the dam is safe. Its executive engineer Irom Mohindro told Down To Earth that they are releasing 20 cubic metres of water—the volume of a medium-size Sintex tank—per second and “fixing some of the leakages reported”. On August 1, the water level was 876 m, nearly 2 m above the spillways. As rains intensified in the first week of August, people on either side of the dam faced floods. Areas upstream have been submerging since March because of the dam, and areas downstream due to rainfall and release of water. The authorities say this could be the worst flood in 200 years. About 60,000 hectares (ha) were inundated and 500,000 people displaced by August 3, according to an estimate by the state revenue department. Most of the paddy crop has been destroyed. The worst affected are the low-lying Thoubal, Bishnupur and Imphal districts, which lie in the flood plain drained by small rivers that flow into Myanmar. The flood’s intensity was so severe that three big bridges were destroyed. Upstream, the dam has submerged 1,200 ha of land, including farms, schools and houses, and displaced 20,000 people, as per official estimates. Nearly 12,000 people are completely cut off because roads too are under water. The dam is likely to submerge 3,000 ha on completion. People in the region have opposed Mapithel dam, also known as Thoubal Multipurpose Hydroelectric Power Project, since its inception in the 1980s. In December last year, the National Green Tribual stayed its construction after the displaced people challenged the clearance given to it for removing 600 ha of lush green forest. The petitioners stated that the dam authorities did not conduct a public hearing before seeking the forest clearance. The irrigation and flood control department has admitted this and the tribunal’s final order is awaited. The current flood has made people more suspicious of Mapithel’s impacts. They say severe floods are a recent phenomenon. Although people in the region saw heavy showers this monsoon, India Meteorological Department (IMD) data shows that the rainfall has been average. Between July 23 and July 27, when most of the rainfall occurred, Thoubal and Imphal East received rain which was 10 per cent less than normal, while Imphal West received 46 per cent more. 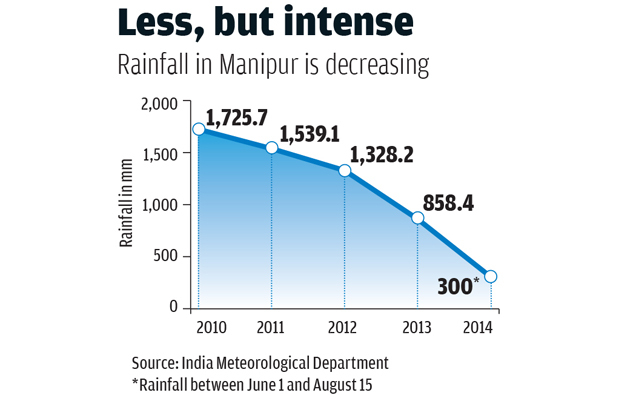 In fact, IMD’s own study shows that annual rainfall in Manipur has been decreasing since 2010 (see ‘Less, but intense’). The pattern of rainfall has, however, changed. A recent study by the Indian Institute of Science, Bengaluru, detected a decline in its “slow rhythms” and a rise in extreme events. The study separated the slow pulses in the monsoon, which last 20 to 60 days, from the faster ones. It found the intensity of slow pulses had decreased over the past 60 years across the country, including the Northeast. This decrease has been concurrent with an increase in short, high-intensity rainfall events, says NirupamKarmakar, the author of the study published in Environmental Research Letters in June this year. Floods in the state have increased since 2005, says R K Ranjan Singh, an environmentalist in Imphal. According to the disaster profile of Manipur, prepared by the National Institute of Disaster Management, floods are occurring due to heavy rainfall in the upper catchment areas in the hills. It shows that 35 per cent of the catchment area of rivers in the hilly areas is degraded. This enhances surface run-off, worsening floods. The Manipur river sub-basin—part of the Chindwin river system—comprises three tributaries, Imphal, Iril and Thoubal rivers, which drain 24,000 sq km area and feed water in the Loktak lake near Moirang. Sutapa Sengupta, professor at the department of geography at St Mary’s College in Shillong, writes in a book, River and Riverine Islands in North East India, that these rivers bring a lot of silt. Thoubal, Bishnupur and Imphal fall in the plain drained by these rivers. In case of extreme rainfall, flooding occurs quickly, causing extensive damage. According to Ram Wangkheirakpam, convenor of Indigenous Perspectives, a non-profit working with the affected people downstream of Mapithel, water released from the dams under construction is also contributing to flooding. However, no study exists to confirm his observation. 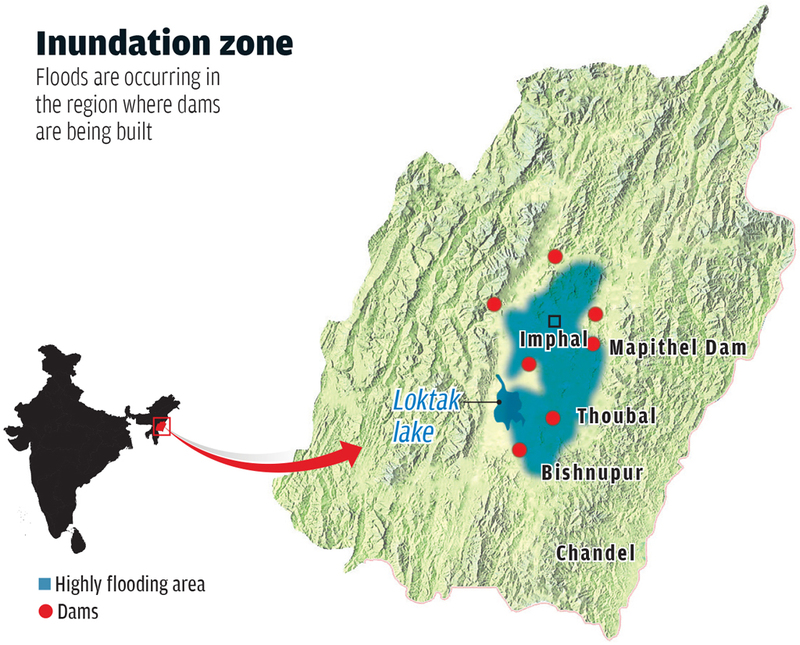 The Manipur government has set up several hydel and irrigation projects in the region that is now witnessing floods (see map). The state has five operational projects and three under construction. Curiously, despite dams and barrages, the planned irrigation potential has decreased over the years. By the irrigation and flood control department’s own admission, this is largely due to inundation or flooding. In the event of extreme rainfall, these dams are not able to store water and end up flooding the same areas they are supposed irrigate, Wangkheirakpam says. Manipur is the only state in India to have enacted the Model Flood Plain Zoning Bill of 1975 that requires identifying areas that get flooded and deciding land use accordingly. But the state is yet to carry out a study on floods. MLA Shyamkumar has written to the Union government, asking it to send a team of experts to study Mapithel and other dams in the region. “I am not against dams but our people should know their impacts, else floods will keep destroying our state,” he says.